The story of Kandinsky’s Composition 1 – a grand, ambitious and colourful canvas that was the first of an important series of paintings – is enmeshed with the broader tragedies of the Second World War. Known now only through a black and white photograph taken in 1912, it was destroyed by a British air raid on the industrial city of Braunschweig in the Ruhr Valley on the night of 14 October 1944. Kandinsky painted seven Compositions between 1910 and 1914, and a further three after the First World War. For Kandinsky, his Compositions were important works as they were based upon expressions of feeling that were then painstakingly developed into arrangements of shapes, colours and lines, often over a lengthy period of time. According to a note in the artist’s records, Composition I was completed in January 1910. Its subsequent exhibition history suggests that Kandinsky recognised the work as important. It was sent immediately for exhibition in London and was then shipped to Odessa, where it was shown at the 2nd International Art Exhibition at the Salon Izdebsky in December 1910. 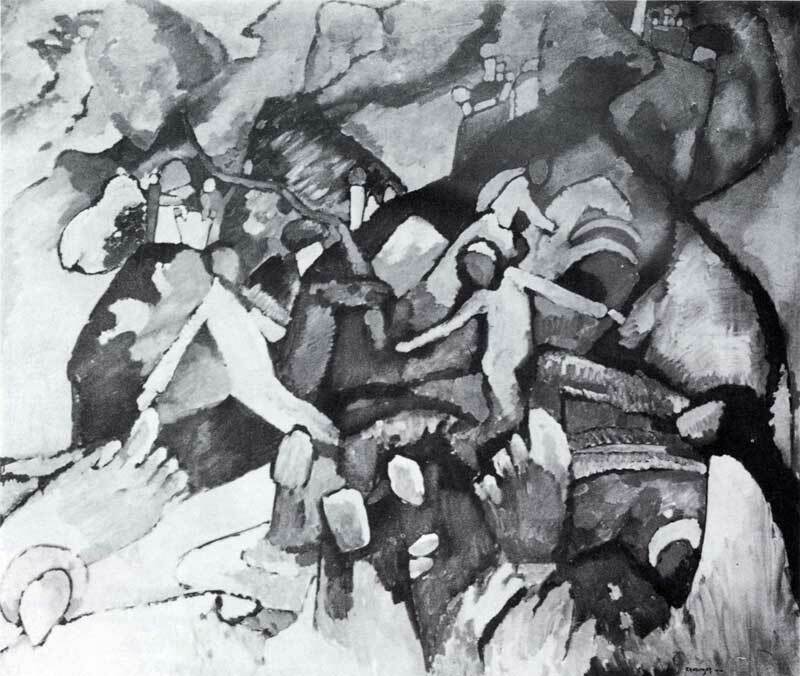 The painting then appeared – with an illustration in the catalogue – in the 1912 Kandinsky Collective Exhibition at Der Sturm Gallery in Berlin, an important centre for modern art in Germany. The dada artist Hans Arp owned it before selling it to a collector and promoter of modernist art in Braunschweig, Otto Ralfs. With Hitler’s rise to power in 1933, the modern art movements Ralfs supported were branded ‘degenerate’. Ralf’s contacts in the museum world were forced from their positions and artist friends were driven abroad. 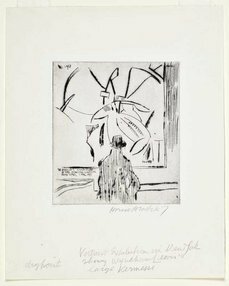 As he was not Jewish, Ralf’s collection was not targeted by the Nazis, and at the outbreak of war in September 1939, his collection still numbered between two and three hundred pieces, including Composition I. As a major industrial centre, Braunschweig was a target for air raids from the beginning of the Second World War. But the air raid carried out by the British RAF as part of ‘Operation Hurricane’ on the night of 14 October 1944 was unprecedented in its devastation. A massive firestorm ensued and left fires burning in the city for two and a half days, destroying 90% of the city’s medieval centre, together with Ralfs’s home and art collection. Kandinsky died not long after the raid in December 1944. Forced to leave his teaching post in the Bauhaus, he spent his last years in Paris, knowing that significant portions of his life’s work had been destroyed in Germany. Ralfs, however, survived the war and opened a gallery dedicated to modern art, which he ran until his death in 1955.